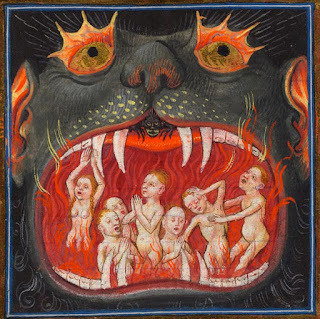 I have posted many times about hell over the last few years but for some reason, my last post (which you can read by clicking here) which questioned the doctrine of eternal conscious torment was picked up on and spread like a wild-fire across the internet, racking up 11 000 views in the few days since I posted it already (as of March 2018 it's over 26000). I have had a hard time just trying to keep up and respond to all of the comments on the blog and in various Facebook threads. So I thought that I would attempt to answer all of the questions, clarify all of the misunderstandings and share a few reflections of my own on everything over here. Below are six areas which I would like to address. The three main scriptural objections that came up were Matthew 25:46, Revelation 14:11 and Revelation 20:10 which are the same three that I addressed in point 1 of my post which makes me wonder if people actually read the article or just experienced a knee jerk reaction to it. I am not going to repeat myself here so I will deal with 4 other verses that were mentioned instead, 3 below and 1 in a later point. The above verse makes a contrast between those who receive the gift of eternal life and those who do not. The shame and contempt referred to however are directed toward those who do not receive immortality. Think of Hitler, the world remembers him with contempt and shame but he is very much dead. A similar understanding can be made for those who will experience the second death in the Lake of Fire. "Then he will say to those on his left, 'Depart from me, you who are cursed, into the eternal fire prepared for the devil and his angels. – Matthew 25:41. Matthew 25:41 speaks of an eternal (Greek aionios) fire rather than of immortal souls residing in an eternal fire. The idea presented consistently throughout scripture is that the fire is unquenchable and will not be put out until it has consumed everything within it. Furthermore, the word aionios also literally means ‘age-during’ as it appears in the Youngs Literal Translation of the Bible. Aionios can indeed and usually does mean eternal but can also refer to a specific period of time defined by an age as well (depending on its context). For example, Romans 16:25-26 says “Now to him who is able to establish you in accordance with my gospel, the message I proclaim about Jesus Christ, in keeping with the revelation of the mystery hidden for long ages (aionios) past but now revealed and made known through the prophetic writings by the command of the eternal God, so that all the Gentiles might come to the obedience that comes from faith.” The obvious interpretation here is one of a specific age rather than eternity otherwise Paul’s statement in verse 26 could not be true. Similarly, Hebrews 9:26 says “Otherwise Christ would have had to suffer many times since the creation of the world. But he has appeared once for all at the culmination of the ages (aionios) to do away with sin by the sacrifice of himself.” Obviously, eternity has no end, the aionios here refers to the central point in history which is Christ’s time on earth and more specifically, His crucifixion and resurrection. So to recap, Matthew 25:41 does not mention eternal conscious suffering, only an age-during fire which consumes everything in it (Hebrews 10:27). If your hand causes you to stumble, cut it off. It is better for you to enter life maimed than with two hands to go into hell, where the fire never goes out where their worm does not die, and the fire is not quenched. – Mark 9:43-44 (context up until verse 48). There are two points to consider regarding this passage. The first is that nowhere does it refer to the duration of the persons existence in hell, that is something that gets read into the text based on our preconceived ideas. The second point is that Jesus was quoting directly from Isaiah 66:24 which says, regarding those living in the new heaven and earth, that they will “…look upon the corpses of the men who have transgressed against Me (God). For their worm does not die and their fire is not quenched”. In case you missed it, the worms were feeding on corpses. Is it not more plausible that the message in the warning is that the worms do not die and the fire cannot be quenched until they have done their job? Or are we to believe that the worms are immortal and the corpses as well? Some of the feedback I received was based on a misunderstanding that I was trying to remove hell from the Bible. This was not my intention at all. Personally, I do believe that Gehenna should rather be translated as ‘Valley of Hinnom’ which is the actual English name for the place Jesus made reference to on multiple occasions. The word hell itself originated in the 8th century AD and probably should not be in our English Bibles at all, literal translations like Young’s prefer to leave the term untranslated as Gehenna which is probably for the better. Yet that in no way takes away from the amount of evidence in the Bible that a grim ending awaits those who reject Christ. A study on the word hell yields a handful of verses in our English Bibles but a study on the fate of the lost yields hundreds of verses that should not be taken lightly. So when I speak of conditional immortality, I do not endorse the idea that there is no torment or repercussions awaiting people in the afterlife, I am simply saying that eternal life is the reward and inheritance awaiting those in Christ alone. Someone sent my wife a testimony of a person who had claimed to have been to hell. A few other people also brought to my attention the parable of the rich man and Lazarus in Luke 16 as proof of eternal conscious torment. There is a lot that could be said on both of these points but I just want to make one observation about both stories. In chapter 20 of the book of Revelation it speaks of something known as the Great White Throne Judgment where the dead are raised from their graves and judged according to their works. Death and Hades are cast into the Lake of Fire along with anyone whose name is not written in the Book of Life. Herein lies my point, Luke 16 is a parable that mentions conscious torment of a man 2000 years ago, all the videos and books we see about people visiting hell are written in the present age. Even if they are real, they precede the Great White Throne Judgment and Lake of Fire which is the second death (20:14). So even if people were actually suffering in Hades right now, these stories have no bearing on what occurs in the Lake of Fire to which no one has as yet been cast into. This reasoning sounds to me as if when someone dies they go to get burnt but are kept alive in flames (Augustine used the example of a Salamander that can survive inside of a fire as his proof that the fire does not consume, I would not recommend testing his theory out), at a later stage, they go for judgment and then they go back to get burnt again in the same setting and in a similar, ongoing manner. I find this exegesis to be rather confusing. That sounds more like a warning of total destruction to me than it does eternal conscious torment. On a bit of a side note, you have probably heard people say before that Jesus spoke more about hell than He did about heaven. It is an often repeated assumption but its simply not true, about 3 percent (roughly 60 verses) of what Jesus said can be categorized as possible references to hell. In contrast, nearly 10 percent (192 verses) of what Jesus said was in reference to heaven, eternal life and the Kingdom of God. One of the comments I received a lot of is that if judgment consists of a measurable amount of punishment according to ones deeds and they are not granted eternal life but will ultimately perish then there is no consequences for sin and we might as well not follow Jesus and just live recklessly. I don’t even know how to respond to that honestly. Sin still has consequences and death is still punishment. Still others seemed concerned that the gospel would not be attractive enough without the threat of eternal conscious torment to influence a persons decision. But in Romans chapter 2 Paul says that it is the goodness of God that leads to repentance, perhaps that is why nowhere in the New Testament do we see the apostles using hell as a motivational tool in their proclamation of the Gospel of Jesus Christ. I see a larger problem behind these questions though in that they reveal that we do not believe that Christ alone is sufficient to sanctify us and cleanse us from sin. We do not trust that the goodness of God can bring people into the Kingdom and so we adapt an insurance salesman strategy, relying on fear to 'seal the deal'. I have shared this because I want to make a few comments about these responses. I get that what I am saying is radically different than what most people have heard before. As one friend said to me, “hearing about annihilation for the first time…it’s initially quite fearful…almost as if a huge ‘pillar’ under-girding your faith is about to collapse…what is the gospel without hell? It is still the gospel”. So I get that the reactions can be quite harsh but let me say a few things in my defense. Firstly, no one likes been vilified and ostracized, I have not written these posts or reached these conclusions lightly. Day after day I hear of people who lose friends, are denied church membership or even employment opportunities because their studies led them to conclude that conditional immortality carried more biblical support than eternal conscious torment did. So no, my view is not the ‘easy choice’ some insinuate that it is. Secondly, I have provided a list of well over a hundred scriptures without commentary to show how the Bible consistently deals with the subject of the fate of those who do not know Christ. If it appears that I have twisted scripture then read that list by clicking over here free from the biases that I might be imposing on them. Thirdly, I do not believe that ones intellectual, eschatological persuasions are a salvation issue. Yes, they are certainly important as they depict a certain image of God in the world and we are called to 'not bear false witness' so let’s flesh this stuff out together and move toward a right understanding. But is Christ your Lord? Great! Let’s proclaim the love of God and the way to eternal life through Jesus side by side. Hopefully, we will figure out and agree on the finer details together along the way. I saw the reaction you got. Let's call it what it is: self-righteous, ignorant and hysterical. Well, I was gonna actually make a reply here but this post right here, I think, says it all. It's evidence that when one can't address the issue they simply resort to ad hominem. Perhaps a dictionary would help. Why is it that claims of "self-righteousness" are always hurled when one disagrees with a POV but says NOTHING about themselves? Why is it that one who disagrees is "ignorant" and "hysterical" because they have a different POV? Even better, exactly how is that following Christ's example and God's Word to esteem others as more than yourself? Could that be a Giant Sequoia Tree stuck in your eye socket? Now, that said, the only point I would make to the author and article is toward his comment, "But if death refers not to dying but to simply being separated from God..." and I would simply point him to Rev. 20:12. Royce, you were not there to observe the Facebook incident I'm talking about. As I've already explained, those are accurate observations about behavior, and not insults characterizing the person. We are not to esteem bad behavior highly, and are free to speak truthfully about what it is. I interact daily with those who disagree with me on this issue, and have never seen such an appalling reaction as I saw to Wesley's post. My observations had absolutely nothing to do with the fact that they disagreed or had a different point of view. You act as if this is true just because you said it, even though you have no way of knowing. You do realize that they're resurrected, right? Jesus is coming back to judge both the living and the dead (2 Tim 4:1), meaning that the now-dead will be brought back from the grave in order to face their judgment. 1 Thessalonians 4:16 says "the dead in Christ will rise first"—this can hardly mean "the separated from God will rise first." So also in Revelation 20:4 & 5 it says "they came to life" and "the rest of the dead did not come to life until..." Straightforwardly, when all of humanity who had died comes back to life, they stop being dead. When verse 12 John sees "the dead... standing," it is obvious that they are no longer dead in the vision (after all, they come out of Death and Hades), though in the present reality they are indeed the dead because this hasn't happened yet. Revelation contains a decent amount of analepsis and prolepsis, due to its complex time structure. For example, John is seeing something in the present that will happen in the future, and yet he refers to it in the past ("I saw the souls of the martyrs who had been slain"). As such, the argument you're trying to mount from Revelation 20:12 never gets off the ground. In fact it includes both the unsaved and the saved (and how can the saved be "separated from God"), and God is literally right there in front of them. Thanks Peter for a well worded response to Rev 20:12. For the record, I never took your original comment to be 'name calling', it was simply an observation of the knee jerk reaction that exploded on a specific comment thread. The comments made no attempt to engage in the blogs content at all. I saw it as you called it. I think I'd prefer to say it is conservative people not yet ready for a change that I too believe is of God. I don't think there's point, or much love, in being derogatory or condemning. In all changes, there are early adopters and those who come later to the same conclusion. I think the same will be the case here - perhaps many individuals won't change, but many churches will, I believe, in time. If this is of God, as I believe it is, the Holy Spirit will be slowly convincing people. Wesley, 11,000 views is amazing. Well done! It goes to show the gap between a small blog and a viral one is really very small. But of course value isn't measured by numbers, but by people who are encouraged to think a little more. I hope you got plenty of those too! Hi Eric. I must say that from a writers perspective this whole thing is very intriguing. It's about to hit 15000 views and is showing no signs of slowing down. I never entered key words for search engines and I never really said anything new that I hadn't mentioned elsewhere before. I was also removed from the Christian Blogging Network where I often share my blogs. The only thing I can think of is that the title was enough to get people to click on it and word of mouth via Facebook comments and shares seems to have done the rest. Yes, it is all a bit mad. I doubt it was key words or Google at all, but viral sharing. I would guess that someone who disagreed with your ideas shared it and their friends shared it and pow! It must be exciting and gratifying in some senses, but frustrating in others. I used "self-righteous," "ignorant" and "hysterical" in purely descriptive terms. I was able to witness those reactions in real-time, and it wasn't pretty. I saw a kind of hysteria, there was demonstrable ignorance, and such condemnations as "woe to you from God on High!" are the very definition of self-righteous condemnation. So I don't think to describe them that way is unloving or condemning. I also believe the change is of God, just as God has presented this truth plainly in the Bible since the beginning. But while it's true that some people come around later than others and are not yet ready for change, that doesn't seem to justify the harsh treatment of others. Hi Peter, I agree that harsh treatment of others is unjustified, and I know that conservative christians can be very harsh. But I don't think it helps to win people over to label them and be harsh in return. Why not just point to the problem without labelling? It's like bringing up a child or being a teacher - the experts say to criticise and discipline bad behaviour, but not to label people as being "bad", for that can tend to entrench the attitude rather than help them to change. Let's be exemplars of the change we want to see rather than continue with negative behaviour. I'm sorry that you feel that I was labeling people and being harsh to them. I'm not being anything *to* them, because they're not here, they're in a closed Facebook group. So I'm not trying to win them over either, and with people I'm trying to win over in various contexts I will use what seems the best approach out of a range of approaches I use. I certainly wouldn't recommend whipping out these terms in dialogue, so I don't know why you'd say I'm trying to justify the harsh treatment of others. I was merely describing the behavior I was privy to elsewhere. The words I selected I do want to be able to use if I think they are the best descriptors of problematic behavior, and this case that allows me to make the point that I wanted to make: the behavior was particularly bad in those ways. If I were labeling those people, I would be saying instead that each is a self-righteous, ignorant and hysterical person, which I can't possibly know. Hi Peter, thanks for your response. I too am genuinely sorry - sorry if I've said anything I shouldn't have and sorry if I've offended you or misjudged you. I responded as I did because I felt "self-righteous, ignorant and hysterical" were not helpful words - not helpful to the discussion/debate, to the people you are criticising or to you. It didn't seem to me to be "speaking the truth in love". But I think I have said enough, and I'll say no more. Thanks. Thanks Eric and Peter. Yeah it was pretty ugly. I found that calm responses settled some folk down while others spun more and more out of control. Perhaps it's more of a case to case thing than a general rule of what works. Though I got the strong impression that some folk would never listen regardless of the approach. Thanks Reese.it's certainly caused me to reflect how I've handled the situation and check my own heart. Maybe I can learn more from this experience than any of the readers will. Wesley. Despite what you claim should be a fair response to your posts, I believe that it is wise to avoid a theological debate with you, especially on this kind of platform. Mainly because that's precisely what you crave. It's also wise because you have clearly made up your mind on these matters, and there will be no convincing you. The die is cast. There are those fall into error but will listen with humble hearts when somebody points them in the right direction, because obedience to God's Word is paramount to them - but you ain't one of them. You know full well where I stand, and trying to speak sense to you in this manner is as sensible as negotiating terms with a fox whilst it is in the henhouse. The fox is in the henhouse to do damage. I have biblical reasons for calling your teachings heresy. I have biblical reasons for naming your teachings as false. I have biblical reasons for naming you a ravenous wolf in sheep's clothing. You are proposing false doctrine not only in this post on hell, but in many of your others too. I base my opinion on literal readings of the scriptures whilst yours appear to be based on a twisted, personal interpretation that suits your agenda - to water down the cross, the deity of Jesus, the church, spiritual authority, and the scriptures as the actual Word of God. You claim to be radical and original, but you really are not. You are just regurgitating all the false teachings by the group of guys you follow, and the many that they have followed in turn. PS - annihilationism has been tried for millennia. I even remember someone trying it at our church when I was a kid. Way back, when this all started, why did you claim to know nothing of some of the authors that I asked you about, yet at the same time you had already sent me and others their free books and was regularly quoting from their works? Surely that was deceitful in itself? Why did you feel it necessary to hide your sources? You would do well to study the scriptures hermeneutically, instead of selecting scriptures to suit what your are attempting to say. With that in place, you would struggle to come to your conclusions about a great many things. Again, I would much prefer a face to face debate in public (not a "discussion" or "conversation") rather than a "hiding behind my keyboard" type fest. If you want to preach publicly, you need to be able to handle a public response. Positive or negative. PS - I am not self righteous. I am flawed and repent of my sin daily. However, the Word of God is eternal and flawless and is all I rely on. I am not ignorant because I disagree with your theories, but they are in sharp contrast to the Word of God, and in my ignorance, I recognise that. Just because somebody apposes you directly, openly and strongly, does not mean that they are angry, hysterical or unloving. To the contrary, that person is courageous and selfless. They are saying what others have been desperate to say, but have not had the courage. They are sacrificing their personal time, dignity and are setting themselves up for a beating. But it's a beating that I'll gladly take for the Truth. "I have biblical reasons for calling your teachings heresy." Hi Ryan. Individuals today don't get to pick and choose what is considered heresy, and even if they did, it's easy to see how one opinion can be canceled out by the contrary opinion of another. You have no special authority to pronounce who is and is not saved, should you go beyond the criteria given by Jesus himself. That's why the church has deferred the matter to various councils of godly men. So which council do you accept as authoritative, that also condemned annihilationism as damnable heresy? "I have biblical reasons for naming your teachings as false." What are some of your biblical reasons to name conditional immortality as false? Conditional immortality refers to the idea that only some people live forever (are immortal), not all. In contrast, the traditional view of hell has taught that all are immortal (universal immortality), though they end up in different places. Where does the Bible speak to the issue of immortality to support its application to all, rather than some? Oh, I just googled Steve Chalke, I wrote a post about John MacArthurs views in which he had reacted to a Steve Chalke quote once. I have never read or heard anything of Steve's apart from the quote that MacArthur and his friend were discussing. My comments in the post that I wrote were purely a reflection on what MacArthur was saying and my concerns with it and had nothing to do with Steve. So I cant comment on his books or beliefs apart from that we both disagree with John Calvin's understanding on the atonement which is what the brief comment MacArthurs friend quoted was addressing. Thats fair - no issue with that. However, you seem to have an issue with the scriptures through the lens of what Calvin says. Calvin was completely off kilter and I do not respect Calvinism in any form whatsoever. It is a false doctrine- period. However, your atonement view is also totally false and de-powers the truth of the gospel, which is exactly what it's intended to do. Stop swallowing these lies and making them your own. Blocking me and Bron from Facebook is lame. Keeping the arguments here on your blog where they can be hidden is also lame. If you want to be public about your "views" then you should be able to stand up to public scrutiny at all times, and on any forum. If you are so sure about your views, then take up my challenge, add me as friend on facebook and let me comment. Don't get me wrong Wesley, I care about you as Wesley, the person. But... I do not care for your mishandling of the Word of God, and especially since you are trying to influence others with it. Hi Ryan, do you mind if I offer a comment about how this looks from the sideline? You speak as if you are definitely and absolutely right ("It is a false doctrine- period" and "Stop swallowing these lies and making them your own."). Yet you are aware that there are at least two other views held by christians - Calvinism, and Wesley's view. So do you not understand that it isn't a given that your view is right, that it is just your view? It isn't a given that Calvin's view is right, or Wesley's, or mine either. So if you just keep saying that you're right and others are mishandling the Word of God, you don't help anyone, you just make people think it isn't worth listening to you. I'm sure that isn't what you want, but it is likely to be the result. Have you ever thought they they might think that it is YOU who is mishandling scripture? Have you ever thought it might be worthwhile explaining why you think your understanding of scripture is the right one? Or ever considered that maybe theirs is the right one? A wise old minister once told the young brash opinionated youth that was me that we often think a strongly worded statement presents the truth, but often it actually inoculates people from the truth. Worth thinking about. Thanks for your time. Regarding Facebook, there were 3 atheist/agnositcs included on the comment thread of the 2 posts you were on. I want them to know Christ but the message that they would have been hearing is that 'real Christians' are name-callers who know everything and devour their own. That is why you were removed while several others who also disagreed with me were not. I am sorry for losing Bronwyn as a FB friend. Regarding hiding out on my blog, I probably have 200 FB friends while my previous post currently has over 22 300 views views, so this is more than public enough for you to share your opinions I think. I will however in future delete anything that becomes malicious and strays from the topics being discussed. Hi Westley.It has been a very interesting read and I can see that you have put a lot of time and thought to this topic as well as everyone who commented. I would like to make use of this opportunity to move the focus away from this intellectual debate. I keep on having this scripture on my heart were Moses met with God on Mount Sinai and he had to hide his face from the Glory of the Lord. And then the thought, that the same God lives in us. I would like to ask a question which I also asked on the Facebook comments. The question I asked to every one of us is not to be answered with our intellect, but rather for us to be inward looking into our hearts. That place were our spirit man, our soul and mind meets (which is also a mystery which we will one day fully understand) and reflect from that place. Do we have a love relationship with our heavenly Bridegroom, Jesus Christ? let him that is athirst come. And whosoever will, let him take the water of life freely. Hi Sampie. In response to yours and also Lindseys question which was 'what is the purpose or intention behind this and what brought me to this place? ', I'm gonna write something about that in my next post in the next week or so. I'll tag you both when I post it. Let's do coffee sometime!